President Buhari said this during an interactive session with Osun State traditional rulers in Osogbo. The meeting was held at the Banquet Hall of the Government House as a prelude to the presidential campaign rally that followed at the Osogbo city Stadium. 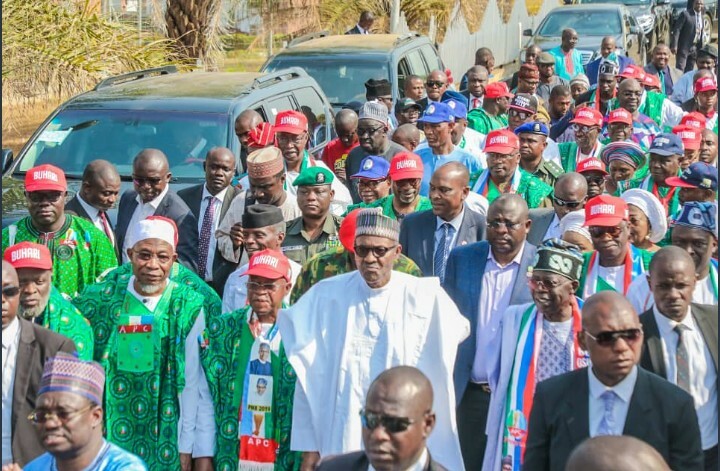 President Buhari was tacitly responding to the allegation by the Peoples Democratic Party (PDP) that the huge crowd at APC rallies across country were bought. Addressing the traditional rulers, President urged them to assist the government in the area of security by working with the police, because they are closer to the people. He said, "I am meeting you because you are nearer to to the people and if you work hand-in-hand with the security agencies, then our nation will be free from all forms of insecurity and secured. "We understand the fact that issue of security is beyond a far distance approach, hence the need to incorporate the traditional rulers to ensure safety, peaceful coexistence and stability across the country. President Buhari also used the venue to praise the performance of the APC governments in Osun State since the emergence of former Governor Rauf Aregbesola administration. In attendance at the meeting with traditional rulers were Vice President Yemi Osinbajo, APC National Chairman Adams Oshiomhole, former Interim National Chairman Chief Bisi Akande , Campaign Council co-Chairman Asiwaju Bola Tinubu, Deputy Governor Benedict Alabi, former Governors Bisi Akande and Rauf Aregbesola, former Deputy Governor Iyiola Omisore, Ministers Isaac Adewole, Rotimi Amaechi and Dambazzau , Senators Olusola Adeyeye and Babafemi Ojudu, State party chairman Gboyega Famodun, as well as Special Adviser to the President on Media and Publicity Mr Femi Adesina, who is an indigene of the state. About 90 traditional rulers led by the Ooni of Ife, Oba Enitan Ogunwusi attended the interactive session with the President. In his address, Former Lagos State Governor and APC Chieftain, Asiwaju Bola Hammed Tinubu recalled that the PDP governments failed to recognize the late Bashorun Moshood Abiola, the presumed winner of the 1993 Presidential election, who was denied the fruit of his victory in addition to being incarnated in prison where he died in controversial circumstances. He said President Buhari did not only recognize Abiola posthumously, he declared June 12, the date of the election, as Democracy Day. APC National Chairman, Adams Oshiomhole said with the crowd he saw in Ibadan and Osogbo today, he is convinced that Buhari would win. Senatorial candidates Bashiru Ajibola (Central), Ajibola Famurewa (East) and Adelere Oriolowo (West) and House of Representatives candidates were given party flags.